A wagging tail. Excited panting. Ears flapping happily in the breeze. All of this can only mean one thing: your dog is riding in the car. Dogs are man’s best friend, and in many households, pets are part of the family, so allowing your furry friend to ride in the car is a must. Unfortunately, the excitement of taking a road trip with your furry BFF can quickly wear off when you notice their hair is everywhere; on the seats, on the floor, and somehow even in the glove box. As most pet owners know, removing pet hair from your car can be an extremely difficult and time-consuming process. 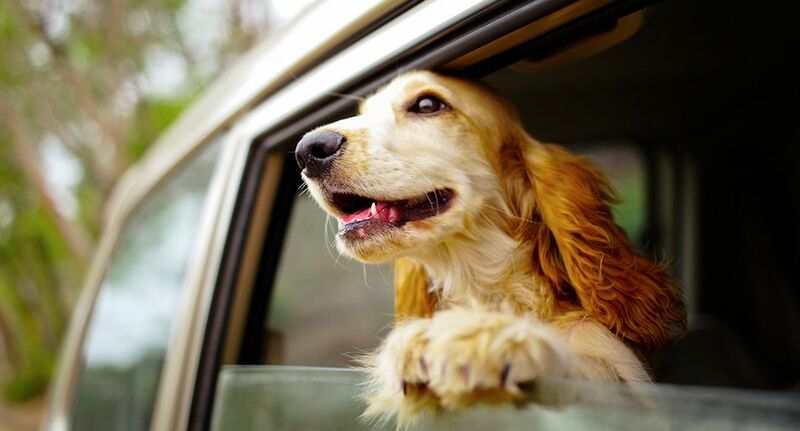 Luckily, we’ve compiled this list of 10 ways to remove pet hair from your car. Full of useful tips and tricks, these 10 dog hair removal methods will leave your car looking fresh, clean, and ready for more adventures with your precious pet! When it comes to removing pet hair from your car, prevention is better than cure. Given this, it’s a good idea to brush your pet before letting them in the car. This way, any loose hair is removed beforehand, minimising the amount of pet hair that gets in your car. Seat covers are another handy way to reduce pet hair in your car. Specialist pet seat covers keep pet hair off your car seats, while any hair that does get on the seat cover is contained to one manageable area. Plus, seat covers can be easily removed and cleaned after each journey. If you don’t own a car seat cover, placing an old towel over your car seat can have a similar effect. When it comes time to actually clean pet hair from your car, rubber gloves are a great tool. Put on a pair of everyday rubber cleaning gloves, then sweep your hands over your car’s upholstery. Loose strands of pet hair should stick to your gloved fingertips, while the remaining hair should form in large clumps, making it easier to remove or vacuum. Be sure to sweep your hands in one direction, so any loose fur gathers in one pile. If this doesn’t get rid of all the pet hair, you can wet the rubber gloves (or lightly spray your car’s interior with water) and repeat this process. Using balloons to collect pet hair might seem slightly like a slightly left-field suggestion, but it can be highly effective. By harnessing the power of static electricity, balloons are an excellent tool to remove pet hair from your car. Simply rub a balloon over your car’s interior surfaces, and any loose pet hair should be lifted off the upholstery and stick to the balloon. From there, it’s as easy as wiping the pet hair off the balloon and repeating this process until your car is hair-free. This method is great for removing loose pet hair, however, it is unlikely to remove stubborn, embedded strands. Fabric softener contains ingredients that are specifically designed to loosen hair, so it makes sense to use it to remove pet hair from your car. For this method, mix 2-3 teaspoons of fabric softener with water in a spray bottle, then spray the mixture onto your car’s upholstery. Next, wipe the upholstery with a paper towel to loosen any stubborn strands of pet hair. Once these strands have been loosened, you can vacuum any remaining hair. Duct tape is an ever-reliable way to repair almost anything, so it should come as no surprise that you can also use it to remove pet hair from your car. For this method, roll a piece of duct tape around your hand (with the sticky side facing out), firmly press your hand onto the affected surface, then lift it up and marvel at how much pet hair you have collected. From there, it’s simply a matter of repeating this process – ensuring you regularly replace the duct tape once it loses its adhesiveness – until your car is clean. Sometimes, the simplest solutions are also the best. As such, vacuuming the interior of your car will usually remove most of the pet hair. To ensure optimal results, it’s a good idea to buy a specialist vacuum nozzle with rubber bristles, which are specifically designed to collect hair. If you’re trying to remove pet hair from your car quickly, then a squeegee is a fast and cost-effective option. Much like rubber gloves, the squeegee’s rubber blade will catch pet hair as you drag it along your car’s seats and floors. This will move the pet hair into one pile for quick and easy removal. If you’re trying to remove all traces of pet hair from your car, velcro hair curlers probably aren’t the best solution. However, if you’re looking for a cheap, easy, and effective on-the-go solution, then velcro hair curlers are a fantastic way to remove pet hair from your car. Simply roll the velcro tips along your car’s upholstery and any stray pet hairs will stick to it. Plus, unlike duct tape, velcro hair curlers don’t lose their adhesive qualities after multiple uses, so you can keep spare hair curlers in your glove box in case of a pet hair emergency. Finally, a wire brush is a great tool for removing stubborn, hard-to-reach strands of pet hair in your car. Often, a wire brush is used as the final step of the pet hair cleaning process, as it’s great for removing any final traces of pet hair. Simply run the wire brush along your car’s upholstery until you are satisfied that all pet hair has been removed.